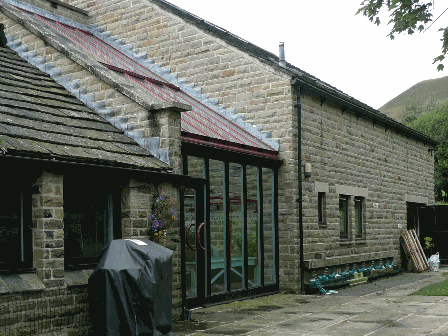 The Peak Centre at Champion House offers comfortable, warm and welcoming accommodation maintained to a high standard. 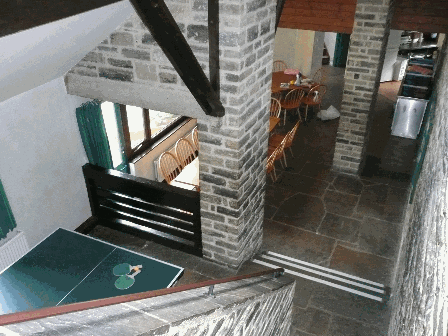 The group accommodation is offered in two wings, John Champion's Barn and Grindslow Wing. You have exclusive use of your part of the Centre if you are a small group and of the whole Centre, including the Broadlee Wing, if you are a large group (maximum 60). Look at our Centre Plan to assist you in planning your visit. John Champion's Barn has a platform lift to give access to the lower areas, a disabled toilet/shower room and (given notice) we can adapt bedrooms to enable the use of a hoist (which you would need to supply). Please contact us with your specific needs - we always try to think of the best solution. Access to the games area of Grindslow Wing is via a ramp which can be installed on request. Access to the meeting room and craft room is through an outside door in the meeting room. 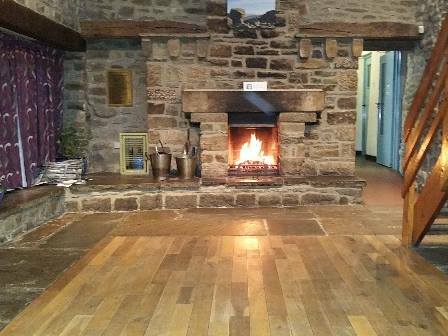 The Broadlee wing contains our Sports Hall, Meeting Room, Craft Room, Resources store and Boot room. These are shared by the two accommodation blocks. If you book the whole centre you have exclusive use of the Broadlee Wing. 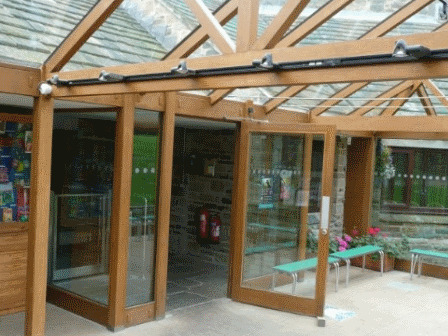 The Conservatory is shared between the two wings and provides a useful extra meeting space, with under floor heating used in the colder months. The self-service shop is located in the Conservatory which sells all kinds of pocket money type toys. In the grounds we have plenty of space for your group activities: two playing fields, a camp fire circle, a small area of woodland, a wildlife pond, a boot wash, a gas barbeque and a car park for 15 vehicles. The Fold, our cabin, is available for group activities. The Peak Centre at Champion House offers complete flexibility, allowing you to self-cater using our well equipped kitchens, use a local caterer or have a mixture of both. Asda, Ocado, Sainsburys, and Tesco deliver to Edale. If you wish to use the supermarket delivery services please book your delivery time for later than your agreed arrival time at The Peak Centre, give them the centre payphone number 01433 670277 as your contact number (as mobile coverage can be very patchy in Edale) and ensure that a member of staff from your group is here to take in the delivery. Communication is provided via a wireless broadband available throughout the Centre. There is a Payphone in the entrance hall (01433 670277) and an EE mobile phone signal in the valley.